How do similar organisms co-exist in the same ecological niche? Everybody has a unique place in the world, a job to do, a niche to fill. When you are a tiny phytoplankter, your place is in the ocean, and your job is photosynthesis. Floating in a seemingly uniform environment like the ocean, how do you stand out and find your niche amid all the other phytoplankton? 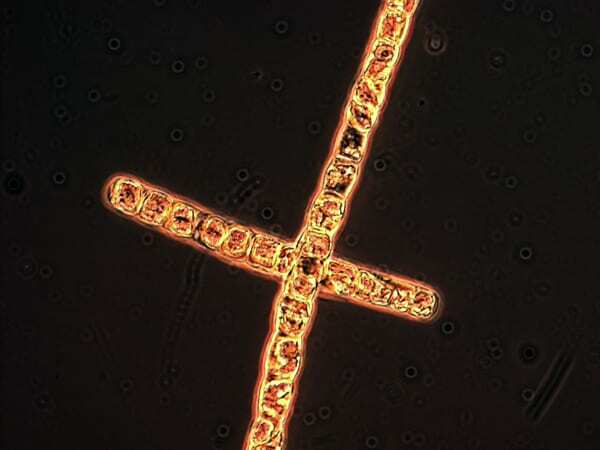 Among these paradoxical plankton is Trichodesmium (pronounced “trick-o-DEZ-mee-uhm”). Although they seem very similar, the six species of Trichodesmium live together, making the plankton paradox a tantalizing question to apply to these phytoplankton. I started studying Trichodesmium in the first place because of their special talents, which make them essential to the marine ecosystem (see Little Things Matter A Lot). 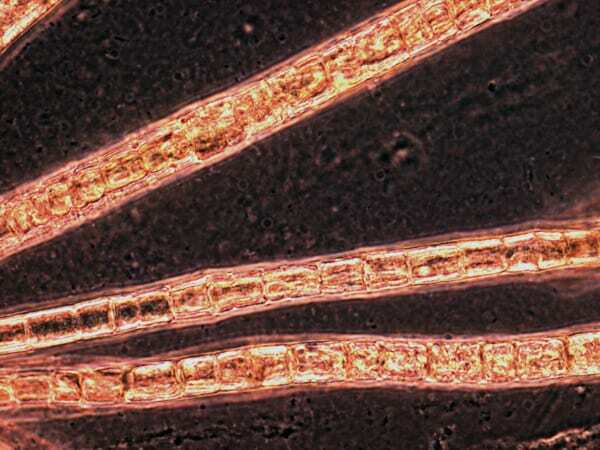 Trichodesmium are cyanobacteria, also known as “blue-green algae.” Like other phytoplankton, these bacteria are capable of fixing carbon dioxide through photosynthesis the way plants do. No, the carbon dioxide is not broken, it is a gas that gets “fixed” into organic matter. Even more impressive, Trichodesmiumcan fix nitrogen gas into a compound that other organisms can use to build their proteins and DNA. Nitrogen gas has a triple bond. It takes a lot of energy to break that bond and fix nitrogen into a different compound. Lightning can do it. With special enzymes to help them, a select few bacteria and archaea (another form of simple, single-celled life) can do it, too. Most organisms get their nitrogen from a fixed source. Fish, copepods, you, and I get ours from eating food. 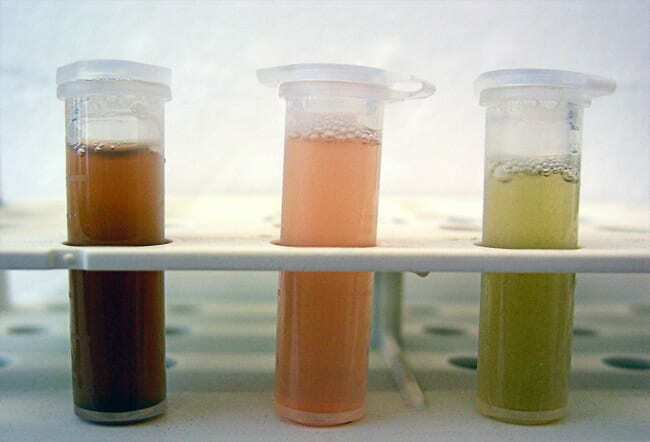 Most phytoplankton and other one-celled organisms get theirs by absorbing waste peed out by animals or decayed from dead stuff. While some places like lakes and coastal oceans have too much nitrogen, the open ocean is nitrogen-barren. That’s why nitrogen fixers such as Trichodesmium play such an important role in the marine food web. 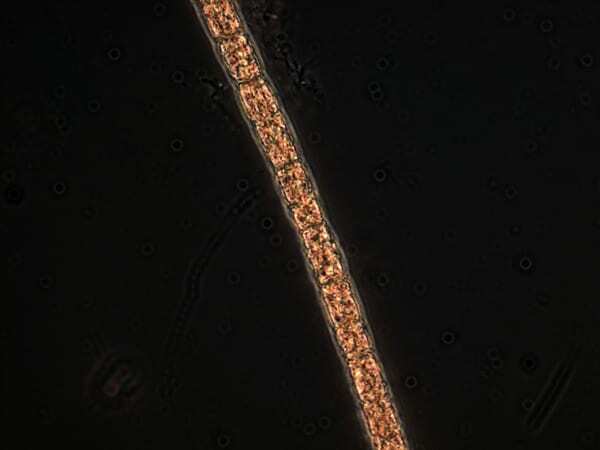 Few critters eat Trichodesmium (perhaps this is because of their stinkiness), but this phytoplankter does spew out a lot of new fixed nitrogen for other bacteria and phytoplankton to use. This source of nitrogen stimulates phytoplankton growth, feeding little guys that feed the big guys and moving nitrogen and carbon up the food chain. Eventually the large phytoplankton die and the little and big guys poop and die. Turds and carcasses clump together and sink, burying carbon at the bottom of the ocean and drawing down concentrations of carbon dioxide at the surface. This link between the nitrogen and carbon cycles can ultimately affect the global climate. But to understand how these chemical cycles work, you have to understand the creatures turning the wheels. That’s where we come in. 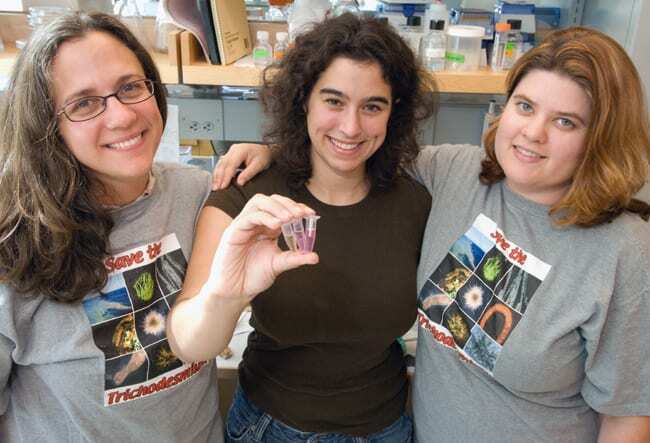 At the Woods Hole Oceanographic Institution (WHOI), we call ourselves “Team Tricho”—P. Dreux Chappell, Elizabeth Orchard, and myself. To find the differences among Trichodesmium species, we put them through all sorts of torture. Just like phytoplankton, we have to diversify to coexist. 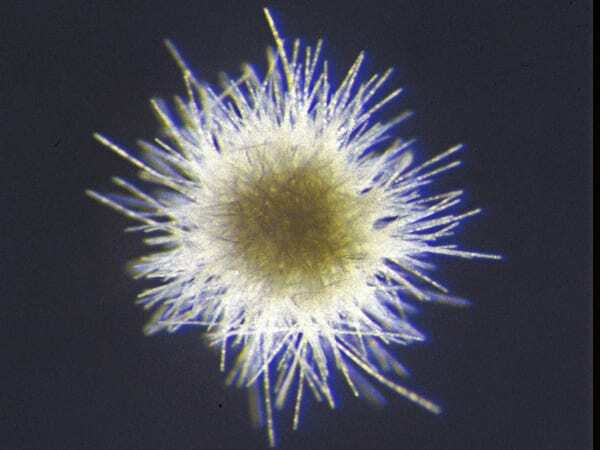 Chappell and Orchard specialize in the ways Trichodesmium obtain and use nutrients in the oceanic desert where they thrive. Chappell focuses on iron while Orchard is devoted to phosphorus. 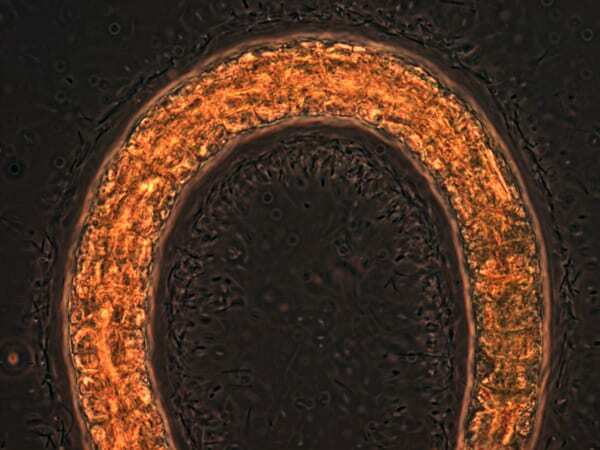 They stress out cultures by withholding nutrients to see how they react. I concentrate on diversity. 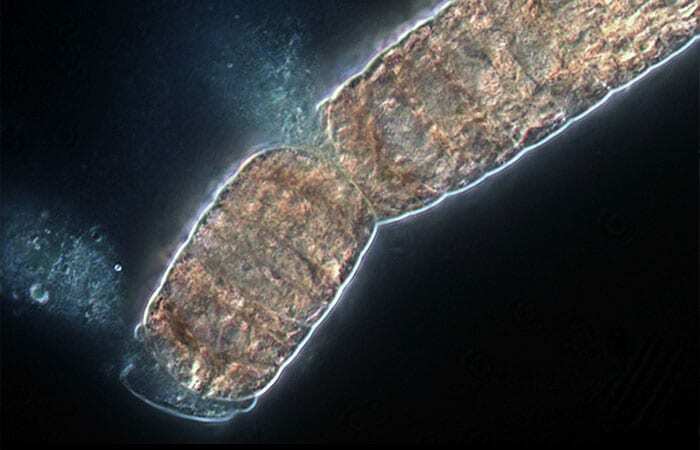 I want to see if Trichodesmium can coexist because they have slightly different capabilities. To do that, I have to get them to grow. My Ph.D. co-advisor John Waterbury has a blue-green thumb. With a combination of patience, curiosity and stubbornness, he grows many cyanobacteria in the lab that refuse to thrive for anyone else. (I tried my hand at cultivating some Trichodesmium from the South Pacific Ocean, but the mailman sent my new isolates to Alaska instead of Los Angeles. They didn’t survive the trip.) Luckily, Waterbury has a large collection of Trichodesmium strains from all over the world. I’m cultivating 22 of them, representing five species, and Waterbury has many more. A variety of answers could explain the plankton paradox. For one, the environment is not as stable as it seems. Seasons, storms, and eddies continually change the ocean, so no one competitor is able to dominate for long. Second, a niche is not just what you do, but how, when, where, and under what conditions you do it. Different phytoplankton prefer distinct temperatures, depths, levels of light, colors of light, nutrient concentrations, and nutrient types. Waterbury and I have been growing Trichodesmium at different temperatures to see who likes it hot. In an accidental experiment, a light went out in my incubator and some species crashed while others limped along under the low light. I’m also going through the culture collection to describe the spectrum of pigments. 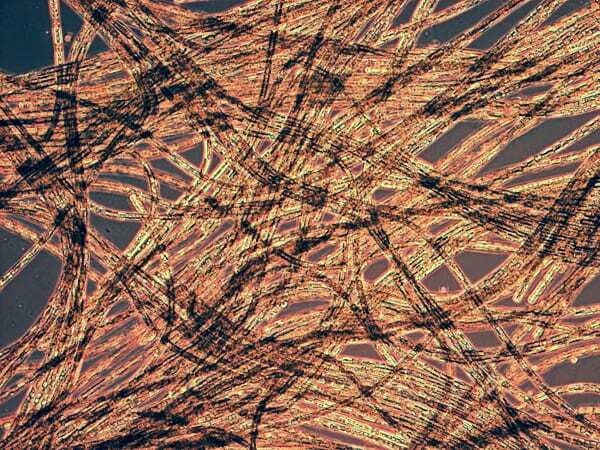 Species of Trichodesmium have a variety of colors: brick red, camel brown, salmon pink, and sage green. The pigments responsible for this range of colors absorb different colors of light for photosynthesis. By using different parts of the light spectrum, diversely colored Trichodesmium might be able to share the spectrum or live where their favorite color of light is more available. They even smell different. I have a couple of strains that smell like stinky fish, but most of them have a range of earthy but caustic smells that remind me of jalapeño oil. But smell is in the nose of the beholder. I’ve asked colleagues how they would describe the bouquet of Trichodesmium. “English breakfast tea,” said Ted Kane, assistant engineer of the R/V Kilo Moana. “Don’t sniff the Tricho,” said Chappell’s co-advisor Eric Webb, a microbiologist at the University of Southern California. Chappell and Waterbury aren’t able to smell them. Trichodesmium cells are quite fragile. It’s hard to get samples from deeper than 175 feet with a net because the stress makes them pop and spill their guts as you pull them up. WHOI scientists Cabell Davis and Dennis McGillicuddy used a video plankton recorder (VPR) to take pictures and count colonies of Trichodesmium (see Underwater Microscope Reveals Surprising Abundance of Life). They found them for the first time as deep as 450 feet, changing the way scientists thought about how deep these nitrogen-fixers are distributed. While the VPR does an excellent job with colonies, it’s not able to see free-living single filaments of Trichodesmium and it cannot distinguish species. Using Waterbury’s culture collection, I have found that the six Trichodesmium species split up into two groups that can be distinguished by their pigments and their DNA. With this knowledge, I developed a method to identify these two groups by targeting their DNA in the open ocean. 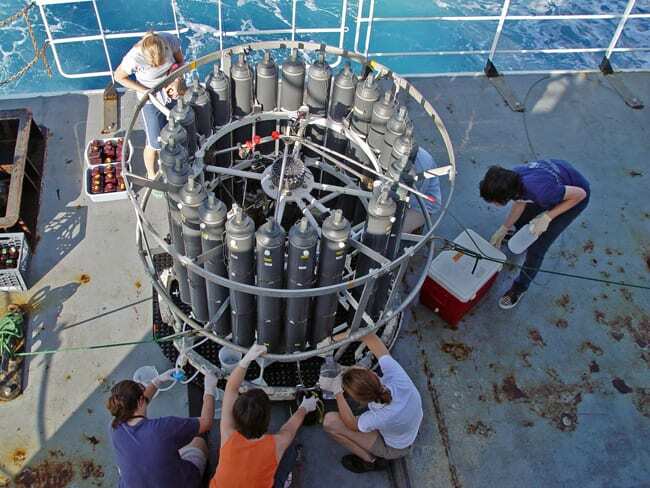 We deploy an array of Niskin sampling bottles from the side of the ship. The bottles snap shut at the depths I select. There are no messy nets, and I can catch single filaments. I filter the Trichodesmium from two to three gallons of water and then analyze the DNA I’ve caught to find out who is there and how many they are. Once we figure out who is where and what they’re doing, we can get a more detailed and global view of the ocean nitrogen cycle. 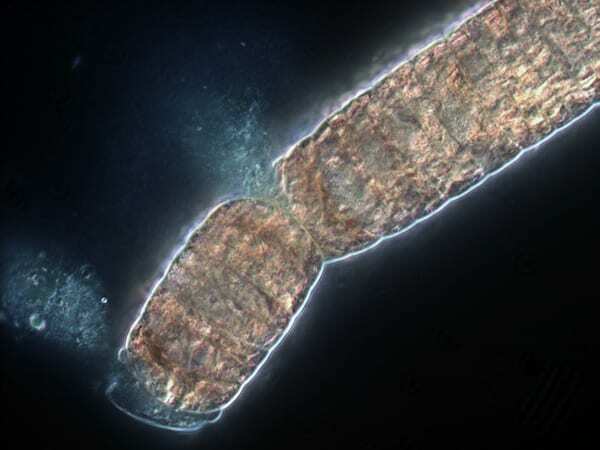 Many scientists lump all the species of Trichodesmium together, saying “Tricho is Tricho and who the hell cares.” I do. And Team Tricho’s got my back. Annette Hynes has been supported by The J. Seward Johnson and The Arthur E. Maxwell Graduate Student Fellowships. 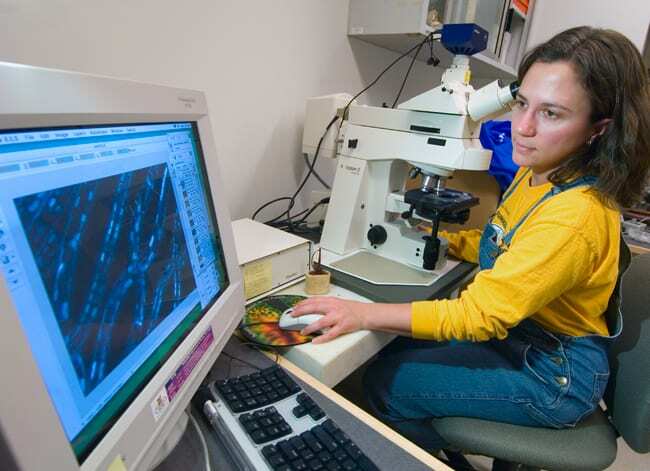 Her research is funded by the National Science Foundation, the WHOI Ocean Life Institute, and C-MORE, the Center for Microbial Oceanography Research and Education, an NSF science and technology center. This article was written during a science writing course for graduate students at WHOI, supported by funds from The Henry L. and Grace Doherty Professor of Oceanography. 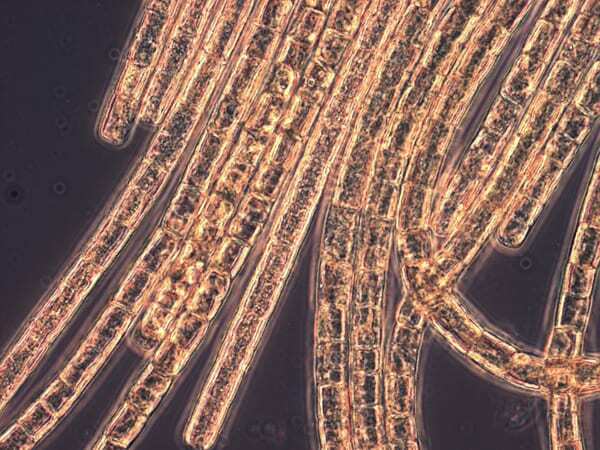 Filaments of Trichodesmium sp. H9-4 come together to make colonies shaped like puff balls. This strain makes puffs, tufts, and free trichomes all in the same bottle. Scientists in the microbial biogeochemistry group at WHOI are studying microbes and microbial processes in environments as different as boiling hot deep sea hydrothermal vents and subzero arctic permafrost. Our research draws from biology, chemistry, and geology to explore how microbial processes are altering today’s world, and to look into the past to the very origin of life in the sea.